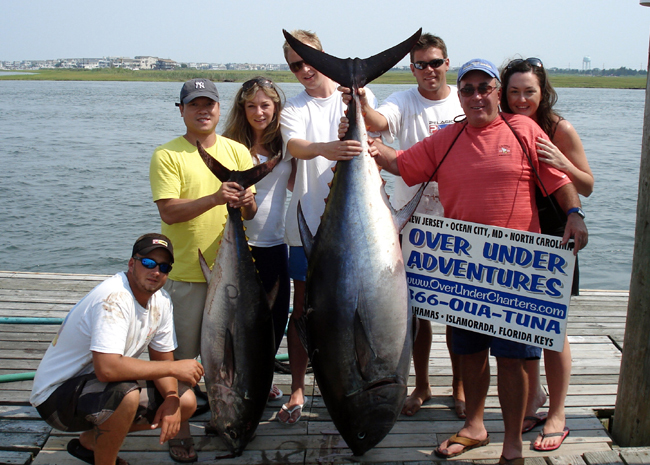 Over Under Sportfishing operates the North East's Premier Offshore Charter Boats. Offshore Fishing for Tuna, Marlin, Sharks and Swordfish is our specialty. Our Overnight Canyon Charters are our most popular trip and we operate two of S. Jersey's largest charters boats, a 48' Ocean Yacht and a gorgeous 55' Custom Carolina Boat. To view our Cape May Charter Boats, please visit Cape May Charter Boats and we hope to see you out on edge this season! 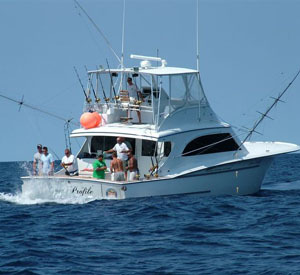 We specialize in Offshore Fishing Charters for Tuna, Marlin, Sharks and Swordfish! From the back bays, to the Offshore Canyons, let the Pros at OU make your day on the water one to remember. We fish tournaments for sharks, marlin, and tuna in tournaments like the Mid Atlantic 500, Cape May Shark Tournament, and Ocean City White Marlin Open. We typically dock at Avalon Point Marina which is one of the most conveniently located marinas, with respect to the inlet, in all Cape May County, New Jersey. Chartering out of Avalon allows our NJ Charter Boats to fish areas not frequented by the Cape May Charter Boats, like the Spencer, Lindenkohl, and Carteret Canyons. We are available to move our boat(s) to Cape May if you would rather fish out of a Cape May marina for any reason. NJ Canyon Fishing for tuna and marlin in the canyons is one of the most exciting big game fishing trips around. You can catch virtually every type of tuna, in addition to swordfish, big sharks, dolphin, and marlin. Maryland Canyon Fishing is second to none, with some of the best access to the North East's most productive Canyons, such as the Poorman's Canyon, Baltimore Canyon, Norfolk Canyon and Washington Canyon! Come join us in either NJ or Maryland for your next Canyon Fishing Trip. Fish with us and see for yourself what top notch Canyon Fishing is all about!